Recently, Kevin was once again hooked on to prawning. Hence, we went prawning 2 days in a row during last weekend. We went to Bottle Tree Park straight after work on last Friday. It was such a relief to leave my work place, because suddenly I hated working a lot! Reached there around 630pm. The sky was gloomy and looked like it would rain any time. So we went to have dinner at their restaurant. We ordered 2 chilli crabs, sweet and sour fish, stir-fried kai lan and white rice. Everything was fine except the chilli crabs. Wasted my stomach space and calories on those stupid crabs. It tasted horrible. After the not-so-sumptuous dinner we went prawning. For one whole freaking hour, NO PRAWNS. We gave up and Kevin suggested that we go Marina South to try our luck again, unfortunately, we were activated for MJ, and we have to answer to that. This prawning trip was slightly more fruitful. Here’s our catch. Not a lot, but the prawns looked quite big. 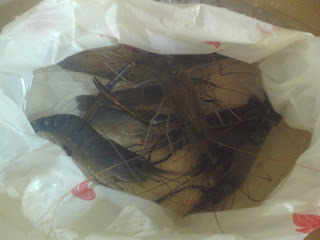 This weekend, we have planned for prawning too, since our MJ kakis have forsaken us and flew to Bangkok. 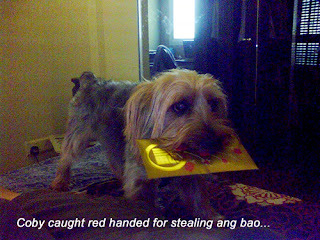 Here's a picture of Coby taken during CNY. So adorable! 14th March is our 9th Year Anniversary. Wow. Long huh. There isn’t any special celebration because my partner is an extremely boring, uninspiring person (and I already gave up on him). And I am not a ‘planner’ because I feel that it is the husband’s job to plan for something special. I agree, females often ‘say one thing and do another thing’. Why? Kevin ‘arranged’ a dinner at this mushroom steamboat restaurant near Chomp Chomp. (I don’t even want to call it ‘an arrangement’; in fact, it was like the usual dinner that we will have after work.) I used to tell him, the mushroom steamboat is nice and knowing that I am very health conscious, Kevin decided to go there for a simple dinner. Guess what, just like typical women, I was hoping to have steak and other sinful desserts. In the end, I wasn’t happy about this ‘arrangement’ and I grumbled. But I guess, women are hard to please and unpredictable. Sometimes I really pity men. Even I myself don’t know what I want, sometimes. Not to even mention men. Aye… women are just hard-to-predict being. I try to suppress my mixed feelings of depression, excitement and anxiety for the past 5 months. I think its time for me to express them in my blog. I still can recall my first month. I was really terrified, petrified, depressed and felt hopeless! I started wondering how I will look like 9 months down the road. The more I think about it, the more I feel depressed. What will happen to my waistline? Can I still wear my favorite skinny jeans? Will my face be bloated? The worst of all, I think I will be overweight as the months go by. During the 2nd month, I was still very much depressed and lost. Seeing a slight change in my waistline is enough to drive me crazy and extreme diet plans started to emerge in my mind. But for the sake of the little one in my stomach, I have to abolish the thoughts of dieting and continue to see my body changes. No one will understand the kind of pain, to watch something happen and nothing can be done. I became more stabilized when I went for my ultrasound scanning. First scanning, I saw my baby’s heart beating. I told myself, I have to be strong to go through the whole 9 months, because the beating heart tells me that my baby really wants to come into this world, and I should not have other thoughts about not wanting it. Second scanning, I was more determined to keep it. The head and body are forming. First trimester was a breeze to me, slight weight gain (barely 1.5kg) and no morning sickness. I considered myself lucky to not have MS. I started shopping for infant clothing from GAP and looking out for loose clothing to hide my bump from friends, colleagues and relatives. Even my family members know about my pregnancy during the 3rd month after the down syndrome test. During my first detailed scan, gynae told me my baby is going to be a boy. I was happy. Actually I preferred having a boy, and Kevin has no preference. I preferred having a boy. Don’t know why, I just think that younger sister should be protected by an elder brother. Currently, in my 2nd Trimester - 5th mth(going to 3rd Trimester soon) I recalled and thought I was really selfish to think that way (during my first 2 months). I did not even think of how I can I be a good mother or what I should eat to make sure the baby is having enough nutrition (since I started out pregnancy underweight). Now, I am still learning to overcome my fear of delivery. Still keeping track of my weight, I try to eat healthier food and ignore my cravings, however, diet is a no-no now. I am very excited about the delivery and hope that July will come faster, so I will pop and get back to my diet and exercise routines. I just can’t wait to see my baby boy. I often joked with Kevin saying that I hope that our baby will not have his big nose and single-eyelid. Kekeke… evil Cel is back in action. As for motherhood, I think I should be more or less prepared. I don’t know. We shall see.